I had my monthly meal swap again last night. This time I made Sweet & Sour Chicken. 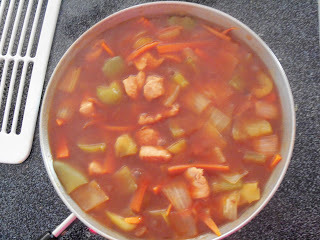 I chose this dish because I had a big jug of Sweet & Sour sauce in my pantry and because chicken was on sale last week. I had a little trouble finding a recipe that uses Sweet & Sour sauce - most recipes I came across included making your own sauce instead of using premade. I found this one at AllRecipes.com that was published by Kikkoman, the manufacturer's of the sweet & sour sauce I used. 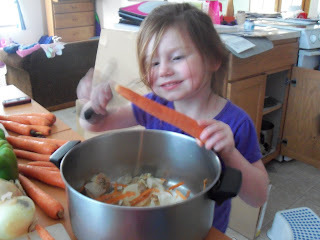 This was a little labor intensive because of all the chopping, but I had some great helpers! 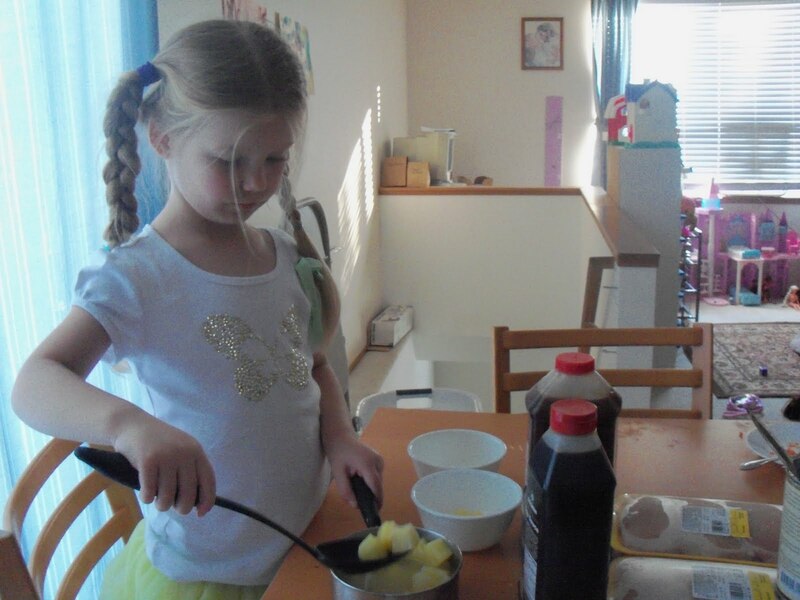 Here Eve is working on the pineapple. She opened the cans, drained the juice, and divided the pineapple into equal portions. Here is Naomi peeling carrots. She mostly has the hang of it, but ended up with several carrot bits stuck to her face (due to particularly vigorous and hilarious peeling motions). 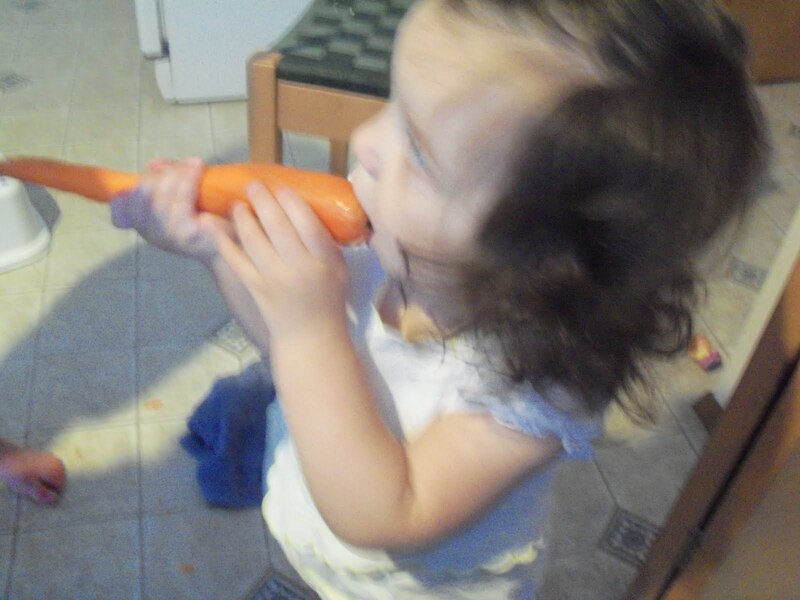 Here is Joanna, wanting in on the action so she sampled a carrot. After all the prep work we had 6 bags of veggies in sauce, 6 bags of rice, 6 bags of marinated chicken, and 6 bags of pineapple. This many Ziploc bags was painful for me, and used up most of my "new" supply (I don't use recycled bags for the meal swap unless I've planned poorly and have no other options). Our Meal Swap group purchase gallon, freezer Ziplocs together (as a group), so these final bags were actually intended to be meal swap bags and weren't as painful for me to use. 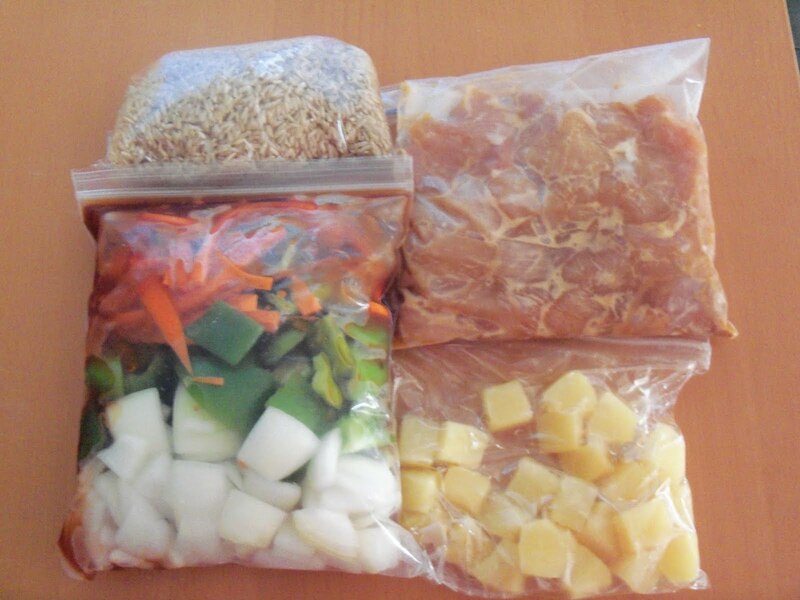 Altogether each meal had four small bags inside the larger gallon freezer bag for a total of 30 Ziploc bags used! Oh well. 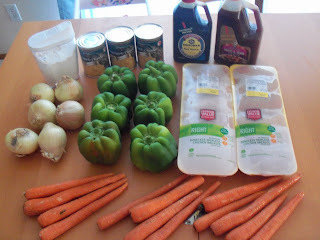 Here is the rest of the recipe, and what I made for dinner last night. We had just enough sweet & sour sauce, the veggies and almost 1 pound of chicken left to make one more portion, but I used all the pineapple in the freezer meals so the pictures don't have pineapple. 1. 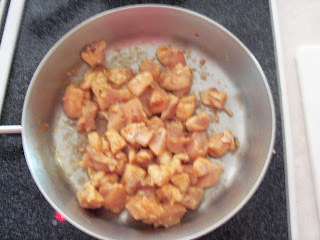 Blend cornstarch and soy sauce in a small bowl; stir in chicken until well coated. 2. Cook chicken in hot oil in a large skillet over med-high hat until outside turns white. Stir in 1/4 cup water. Cover and simmer 20 minutes, stirring occassionally. 3. 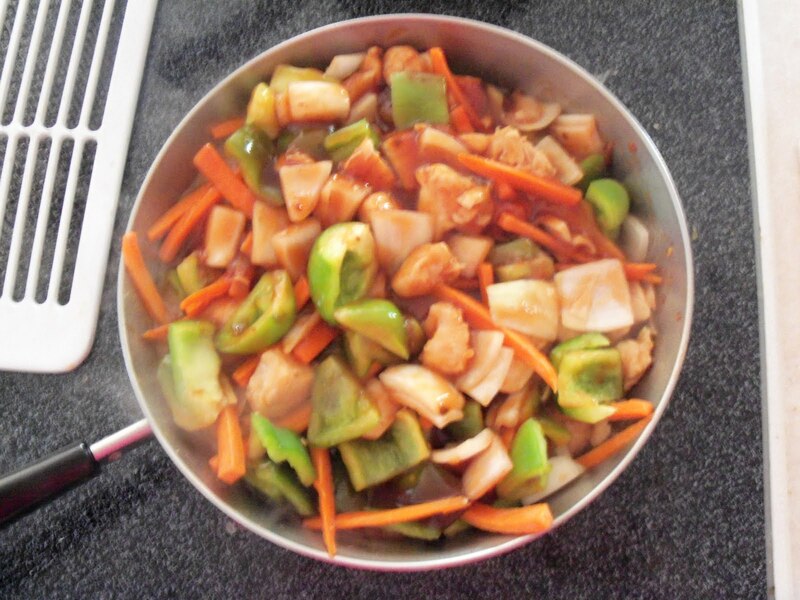 Stir carrots, onion, bell pepper, and sweet & sour sauce into chicken mixture. Simmer, covered, 10 minutes longer, stirring frequently. 4. Add pineapple chunks; cook and stir only until pineapple is heated through. Of course I forgot to take a picture of this with the brown rice on a plate and looking pretty. It was yummy, though a little sweet for me. The meals I received this time were White Chicken Lasagna, Beef Fajitas, White Chicken Enchiladas, and Lemon Pineapple Chicken. If any of you readers are local and interested in joining our swap, let me know. 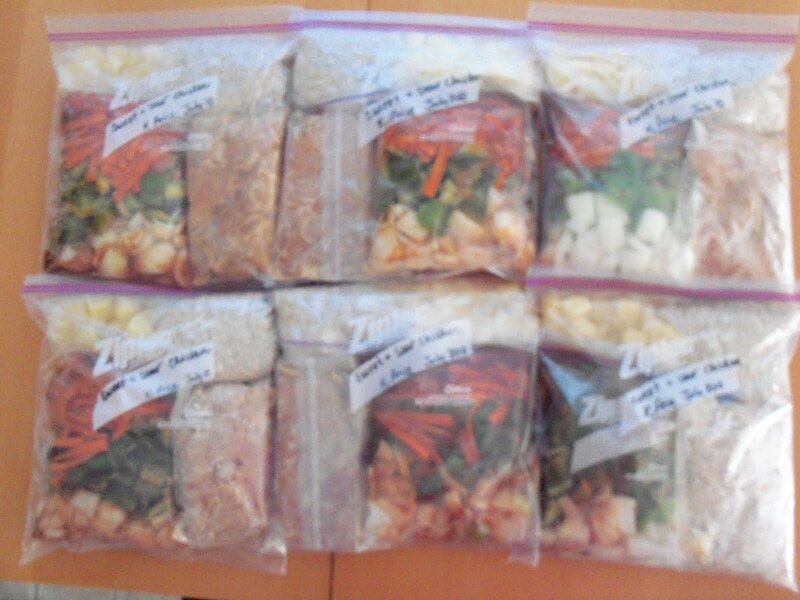 We meet once a month and make meals for 4 to 7 other families (depending on who's participating), 4 servings per meal.